If you cycle often enough in the U.S., eventually you either hear about or experience a close call with a car and/or a confrontation with antagonistic pedestrians, drivers, or police. Here's an incident captured on video that occurred on my home bike commute (Tunnel Ride) just a few months ago. This kind of thing often instills a desire for more support from law enforcement and better bicycle infrastructure. It begs the question of how to get more dedicated bicycle paths, more bicycle lanes, or at least more respect from police and motorists. UPDATE: 2014/06: Looks like some municipalities have the same idea and have created a market for the data. That should spur easier data collection and better data mining: Strava’s Cycling App Is Helping Cities Build Better Bike Lanes. Two years since this post. So glad to see this catching on. UPDATE 2012/08/08: Portland, OR has installed their first automated bike counter. According to BikePortland.org, this is the first one in the U.S. However, some claim that Arlington, VA has had automated bike counters since 2009 (as shown here). Do they make it easy to query all the data you provide to them? In other words, do they share what you give them so you or some other organization can use it? Do they support all the major smartphones (e.g. Android and iPhone)? In other words, are they leaving out half the bike population because they don't have all the software support? Mapymyride.com shares data but makes you join their "partner program" first. strava.com shares data through their REST API ( i.e. a set of simple web addresses that spew data). You can see charts generated from strava data below. http://2milechallenge.com/ shares data by request but has no facility for doing so. shares data on "retail" level. You can download your own data but it is not yet possible to query what others are doing. Unfortunately, what quickly becomes apparent when you try to advocate for those things is that your interests must compete with the interests of all the non-cyclists or anti-cyclists out there, and that competition is stiff. "Think we need more bike lanes for all the new cyclists on the road? ", those competitors will say, "Prove it." Even when representatives are sold on the idea in general, figuring out where and how to design a new bicycle plan or legislation is still a tough question to answer without a lot of data. For these reasons and more, advocates are desperate for good data on cycling activity. Many schedule regular "bike counts" where they literally sit on street corners and tally the number of riders that go by. Of course, there are hi-tech ways to automate this. Some cities, mostly outside the U.S., have invested in video monitoring systems that use sophisticated software to distinguish what types of vehicles go by: essentially, fixed data recorders scattered around a given city. However, these are very costly, not trivial to install, and can present privacy concerns. That's not exactly a slam dunk to cash-strapped car-loving municipalities in the states. New systems like BitCarrier attempt to sidestep the cost and privacy issues but they still involve a significant commitment to install and run. All this can make the monitoring system itself a political decision and, thus, a perpetually deferred one. So what to do? The goal of this blog is to find ways to engage in and promote cycling right now regardless of what legislators are doing or failing to do. Until political will shows up to properly monitor cycling activity, people who care about cycling have to monitor themselves. However, that doesn't mean they can't enlist their own high tech solutions. To that end, there's a sophisticated bike monitor right under our noses, literally, that most cyclists are still not using. In recent years, sport cyclists have become addicted to recording all their rides using GPS-enabled cycling computers or smartphones apps that do the same thing. Not only do these devices help with navigation, they record the latitude, longitude, and altitude of all the points on the ride. That trend has led to websites catering to these sport riders that allow them to upload the GPS data. The sites not only display a map of the ride, they graphically compare each riders path and aggregate that activity by "segment" on the website. Currently, this is most often done so wannabe racers can compare their times against other riders. However, this also provides wannabe advocates with excellent data on who is riding where and how often. Geeking out with all this data collection can make certain cyclist's skin crawl. BikeSnobNYC recently tweeted, sardonically: "Every ride on your high-end bicycle is important. Be sure to document it by means of a cycling-based social networking application." His comment got retweeted over 100 times. Although it is clear why some cyclists want to distinguish themselves from those they might perceive as spandexed, "weight weenies", obsessing over ride times, cycling in general still desperately needs the data that all cyclists can provide. In fact, it is urban cycling in particular that could benefit most from adopting this practice since it is the city where so many of cycling's competing interests reside. NYC's new bike share program equips all its bikes with GPS for just such a purpose (see this StreetsBlog article about that). What's more, cyclists are already wearing video cameras to record accidents and infractions by motorists (see this New York Times article). This video monitoring is analogous to a flight recorder on an airplane. Using a GPS to record rides simply amounts to having a data recorder as well. What's more, this kind of monitoring is "opt-in" whereas other systems tend to record you whether you want them to or not. number of unique riders (aka voters) on a given route in a given time. Data like that is essential when justifying the existence and the placement of bicycle infrastructure and legislation. Some of this GPS data already includes urban cycling routes. Below, is but a sampling of the data found after a few minutes of searching. Imagine what kind of data will result when more cyclists and cycling advocates start recording their rides the same way. Given all the potential for cycling data and its impact, advocacy groups will hopefully adopt the practice of creating and/or identifying key segments of their roadways on these websites and encourage all riders, sport or otherwise, to record every ride they take. At the very least, doing so, would be a great supplement to official bike counts. The detail on cycling activity, if not total number of rides tallied, will increase exponentially. Until recently, the need for an expensive bike computer might have prevented a lot of riders from engaging in bike trip monitoring. However, most people now have GPS-enabled smartphones. Websites like strava.com already have apps that allow these smartphones to record rides and upload data just the way the GPS computers do. In fact, there's little bike computers do that a smartphone app can't anymore. Below are some sample charts generated from aggregate ride data on strava.com. 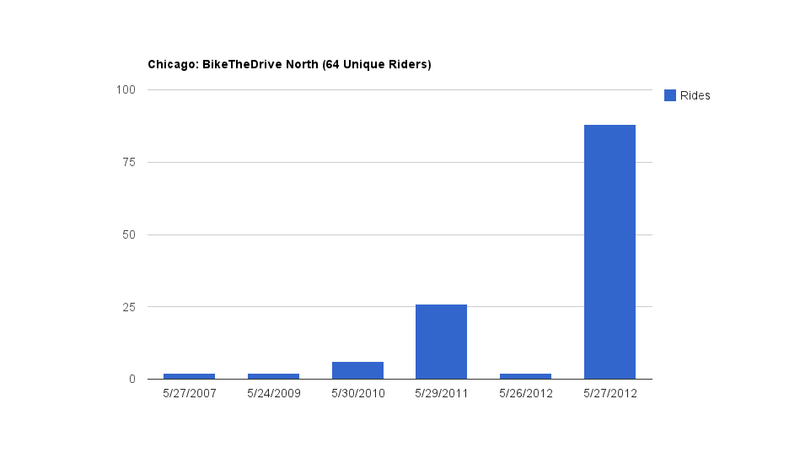 The first set of charts shows all the rides recorded for the "Tunnel Road" ride in the last 2 months. This is a sport ride but it is also my commute home. The first chart in the set shows rides per day with the total number of unique riders. The second tallies the most popular hours of the day. These show the course gets heavy usage by cyclists every day all day long. Given that two cyclists were recently hit on this course, many of us would like something done to improve safety. These charts clearly document the demand and ride patterns that will be affected. 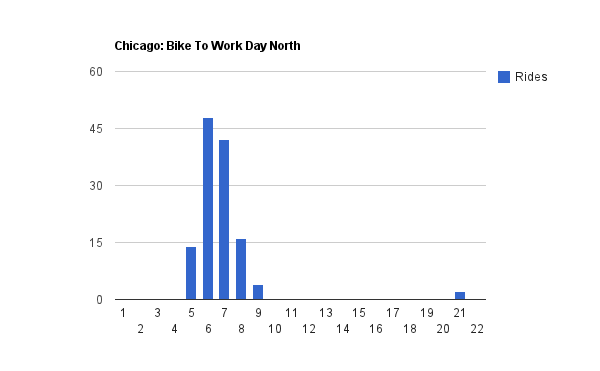 The second set of charts shows all the rides recorded for the "Bike To Work North" ride in Chicago, IL. I'm not familiar with the terrain but this is a short ride that appears to go right to downtown: not exactly a sport ride. The rider volume is not very high but that is what is so easy to fix if everyone starts getting a "data receipt" for all of their rides. 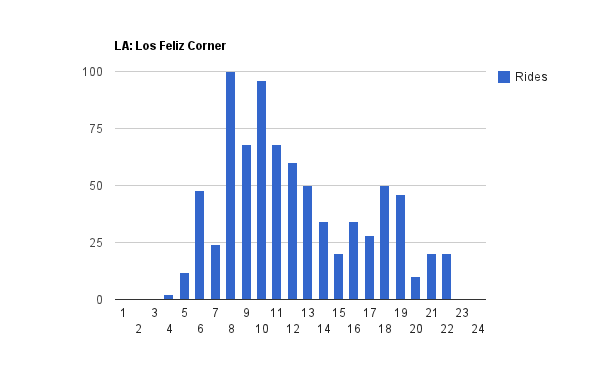 The third set of charts shows all the rides recorded for the "Los Feliz Corner" ride in Los Angeles, CA. This looks to be another urban course. This chart even shows activity over several years. The daily activity appears very low but, even so, the number of unique cyclists is not. Again, so much more could be gained for advocacy if all of LA's urban riders participate.